Tennessee has Nashville and its sweet country sounds. Michigan has the soulful sounds of Detroit’s Motown. Georgia has Macon, a town with a musical history that cannot be tied to one sound or genre. Macon, Georgia’s music history is rooted in soul, southern rock and a little bit of country. You can’t visit Macon without experiencing the music. Here are a few stories you will not want to miss. Some of Macon’s earliest music history began with a man born as Richard Wayne Penniman in 1932 and nicknamed Little Richard by his family. The nickname stuck as started singing in churches before introducing the world to “Tutti Fruitti,” “Long Tall Sally” and “Miss Molly.” One of his earliest performances was at Ann’s Tic Toc on Martin Luther King Jr. Boulevard in downtown Macon. The performance is remembered with a plaque outside the building, which is now the Tic Toc Room. You can also see pictures of his performances at Visit Macon just a block away from the Tic Toc Room. The Otis Redding Foundation has a mini museum that highlights the singer’s life. 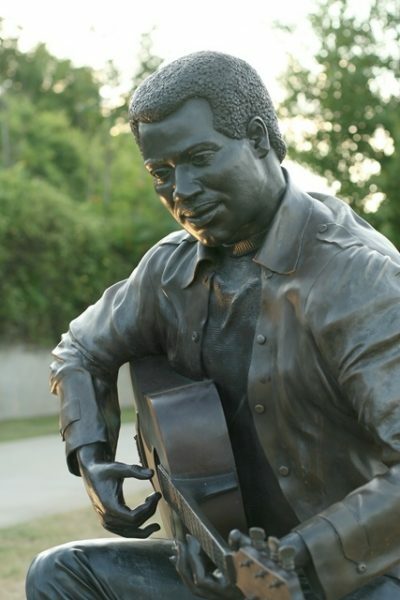 A statue of Redding is at the entrance of Gateway Park, the beginning of the Ocmulgee River Heritage Trail. The Allman Brothers arrived in Macon in 1969 to work with legendary producer Phil Walden, the co-founder of Macon’s Capricorn Records who also produced some of Otis Redding’s hit. Gregg, Duane and their band crafted a unique sound that was a catalyst of the Southern Rock movement. For several years the band resided at what is called The Big House on Vineville Avenue. The house is now a museum showcasing the band’s career. Posters from their most noted performances, instruments and some of their clothing is displayed. Oscar-winning actress, Cher, who was married to Gregg Allman stayed at the home from time to time until the couple moved to Hollywood. The bank also played a benefit concert for former Georgia governor and then-Democratic Presidential candidate Jimmy Carter in November of 1975, a year before Carter was elected president and a replica of the poster is displayed in The Big House and at Visit Macon. Country singer Jason Aldean was born in Macon and some of his earliest performances were at the local VFW and Nashville South, which is also one of the first venues where another country singer, Razzy Baily performed. He also used The Big House as the backdrop for one of his album covers. Aldean occasionally returns home to perform benefit concerts. Phil Walden co-founded Capricorn Records with his brother, Alan and Frank Fenter formed Capricorn records in 1969 but Phil made his mark in the music world a decade earlier. After meeting Otis Redding as a teenager, Phil Walden managed his career and helped him climb to the top. Phil Walden then helped the Allman Brothers climb to the top of the charts. Walden also worked with major artists including Kenny Chesney and Widespread Panic. Phil Walden is buried in the historic Rose Hill Cemetery, which is also the final resting place of the Allman Brothers. The cemetery, located on Riverside Drive, is on the National Register of Historic Places. You will also find the graves of Georgia politicians and Civil War soldiers. Rock Candy Tours has several options for visitors to explore Macon’s music history, including a private tour of Rose Hill Cemetery and Friday night tour of the city’s nightlife. Rock Candy’s co-owner, Jessica Walden, is the daughter Alan Walden, the co-founder of Capricorn Records. The Historic Macon Music Registry is a series of markers on sites that played a part in Macon’s music history. You can download a map and create your own tour. Don’t forget to stop by Visit Macon on Martin Luther King Jr. Boulevard. They have self-guided tour selections and some insider information on Macon’s music history!